The best you can say about the Philadelphia Flyers and their 2018 playoff fortunes is that they were buried at home. Then again, they were buried at home on a regular basis by the Pittsburgh Penguins all season long as Sidney Crosby threw dirt on their hopes throughout the entire campaign. The final goal count for the three postseason games in Philadelphia was 18-6, and overall this season the Penguins swept all five games at the Wells Fargo Center, outscoring the Flyers by a ridiculous 28-9 margin. So, if the hope to get on the same level as the Penguins, who will continue to chase their third consecutive Stanley Cup championship against the Washington Capitals, what are their next steps? The immediate reaction is that there has to be some major change. Some believe that the Flyers were so embarrassed by the Penguins – especially at home – there has to be a response by general manager Ron Hextall, or even those above his pay grade. First on the agenda is the status of coach Dave Hakstol, who is not very popular among the faithful Flyers fans who have filled the building year after year. It is easy to understand why the fans cannot warm up to Hakstol, mostly because he seems incapable of warming up to the Philadelphia fan base. But there is also a legitimate case to be made that Hakstol’s lack of emotion is part of the reason the Flyers had so many slow starts in games. Like it or not, the emotion of a coach is a window into the mentality of a team. And there were many times it appeared his team could've used a spark from behind its bench, especially on their home ice. The view from here is that the Flyers are too invested in Hakstol and a rebuild to make such a major change. Hakstol has evolved as a coach. Compared to Year 1, he's much better at matching talent in games and has done a good job of bringing along young players – which is one of the reasons why he was hired in the first place. Although it is truly difficult to defend the coach of a team beaten so thoroughly at home in the playoffs, that alone should not be the determining factor. There should be a presumption that Hakstol will play a different chord if the Flyers find themselves in a similar situation, just as he has shown the ability to adjust in other areas. It was Hakstol's decision, after all, to make Sean Couturier the team's first-line center, moving captain Claude Giroux to the wing. 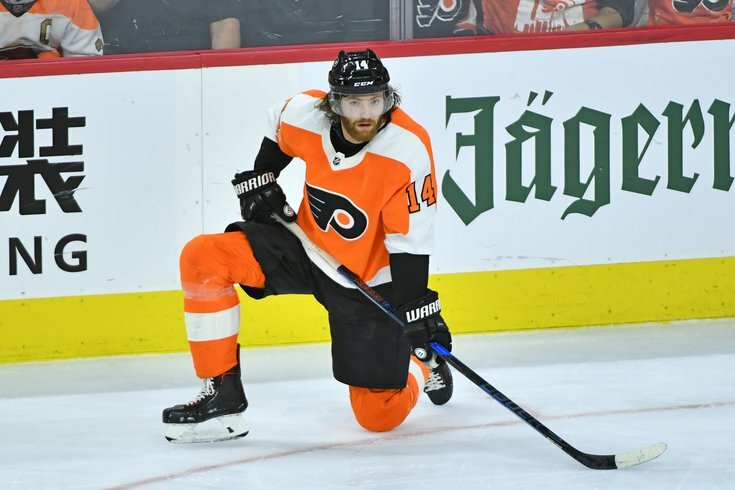 The end result was a comeback season that catapulted Giroux into MVP consideration, while Couturier has suddenly turned into an offensive power. Following a career season in which he finished third on the team in points, the 25-year-old center scored a hat trick and five points in an elimination playoff game, all while staking a claim to the Selke Trophy as the NHL’s best defensive forward. The bigger issue is that Hextall should not detour his blueprint to rebuild the Flyers, and at this point it makes sense to allow Hakstol to continue with a group of young players with bright futures. This season’s edition of the Flyers, which accumulated 98 points during a season in which they went 10 games without a regulation victory, were a toss-up to even make the playoffs, and it took them to the final game to punch their ticket to a fateful series with Sidney Crosby and the Penguins. But what was to be expected? They relied on a pair of starting goalies in Brian Elliott and Michal Neuvirth, neither of whom is considered among the NHL’s elite – and both of whom were lost to injury for extended periods. Making matter more complicated, those goalies were stationed behind a young defense led by Ivan Provorov and Shayne Gostisbehere. The Hextall plan is for that young defense to be filled out with prospects such as Robert Haag (who was impressive), and Travis Sanheim. Up front, Travis Konecny showed signs of being a big-time scoring threat, and Nolan Patrick is a star in the making. And the still leaned-heavily-upon Giroux and Jake Voracek – each of whom sagged in the playoffs. The Hextall rebuild, which started with shedding salary, is on its charted course, and it doesn't seem likely that an otherwise patient general manager will allow one horrible playoff series to change that. No matter how much Hakstol improves or the prospects develop, the Flyers' future won’t be truly bright until the goalie situation is addressed. And it appears that Carter Hart is the answer. Still, it would appear there is at least one more year of seasoning in the AHL before he's between the pipes in South Philly. In the meantime, the Flyers are in the middle of a rebuild, and any quick-fix reflex wouldn’t be a wise path. A better idea would be for the stoic coach and his general manager to wear their hearts on their sleeves for a change and show the fans how much they actually care.